The US-based independent institute Freedom House's "Privatizing Censorship, Eroding Privacy: Freedom on the Net 2015" has thanked the Supreme Court of India for a slight improvement in India's Internet freedom index from 42 to 40 over the last one year, pointing towards how the apex court struck down "Section 66A of the IT Act in 2015, which had been the cause of several arrests for online speech, particularly on social media". The just-released report said that the Supreme Court made "the blocking process more transparent, and strengthened intermediary liability protection", pointing out how "website blocks ordered by the government or the courts temporarily affected entire platforms, such as Vimeo or Google Docs." Recalling how in April 2015, over 1 million people rallied to protect net neutrality and prevent regulation allowing telecommunications providers to charge extra for select services, the report said, after the BJP came to power in May 2014, "India maintained its position as the third largest internet consumer base after the United States and China", but "increased website blocking and intimidation of internet users threatened to hamper India’s steadily improving internet freedom." Sharply criticizing the Section 66A of the Information Technology Act 2000 (IT Act), which was amended in 2008, which provided "a legal framework for internet use", the report said, "The Section had resulted in several arrests of individuals for political or social content published on social media between 2012 and early 2015." Despite the Supreme Court decision to strike down the Section, the report said, "Indian law remains inadequate for the effective protection of privacy. Although a privacy bill is being drafted, reports indicate the law enforcement agencies are seeking to be exempt from the law, leaving its scope and effectiveness under question." The report added, "News reports indicate that the government is continuing to develop the Central Monitoring System, its ambitious nationwide mass surveillance programme directed at monitoring individuals’ digital communications." Criticizing the Government of India for not making the Telecom Regulatory Authority of India (TRAI) independent enough, the report said, the appointment and salary decisions for its members "remain in the hands of the central government". It added, "While the TRAI Act initially barred members who had previously held central or state government office, amendments in 2014 diluted that prohibition, allowing them to join the regulator two years after resigning that position, or earlier with permission from the central government. Members may undertake commercial employment, except with telecom service providers." The report said, "With more than 302 million subscribers, India has the third largest number of internet subscribers in the world after China and the United States. 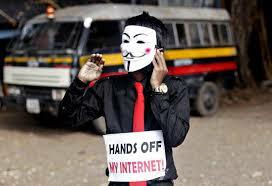 However, internet penetration remains low, reaching 24 percent in March 2015, up from 20 percent in June 2014." HOwever, it said, "Mobile penetration was much higher, reaching 77 percent by March 2015, with more than 969 million subscribers. Nearly 283 million of India’s total 302 million internet users were accessing the web through their mobile devices by March 2015.Wireless telephone access (through mobile) in India represents almost 98 percent of all telephone services, and accounts for nearly 94 percent of total internet access." However, it added, "India was ranked 113 out of 138 countries in terms of mobile broadband penetration", adding, "Despite overall growth, India still has one of the world’s lowest high speed broadband (faster than 10 Mbps) adoption rate, at less than 2 percent. The minimum speed required to qualify as broadband in India was raised to 512 kbps in 2012.This is one of the lowest average broadband speeds in Asia and remains below the global average speed of 5 Mbps". Blaming "inadequate infrastructure" as the main obstacle, the report stated, "The Global Competitiveness Index 2014-15 ranked India 87 out of 147 countries for infrastructure, displaying a steady downward move from 85 out of 148 in the previous year. India ranked a low 103 for electricity supply; and 115 for technological readiness, the capacity of a country to fully leverage ICTs in daily activities." The report further said, "In 2014, less than 20 percent of Indian schools had a computer; of those, less than a third were connected to the internet, and children were actually using them in only 7 percent of schools.Roughly 17 percent of villages in India have internet cafes. Kerala, historically an educationally advanced state, has internet cafes in 97 percent of villages. Yet, even in Kerala, more than half the households do not have a family member who knows how to operate a computer."